MAC is known for their vast makeup range but recently MAC has done quite well with their small skincare range starting with the MAC Lightful C Marine Bright Formula products. The range consists of Lightful C Marine Bright Formula Cleanser, Lightful C Marine Bright Formula SPF 30 Moisturizer, Lightful C 2-IN-1 Tint & Serum with Radiance Booster, Lightful C Vibrancy Eye Cream, Lightful C Marine Bright Formula Essence, Lightful C Marine Bright Formula Moisture Cream and lastly Lightful C Marine Bright Formula Softening Lotion which we will be talking about more in detail below. 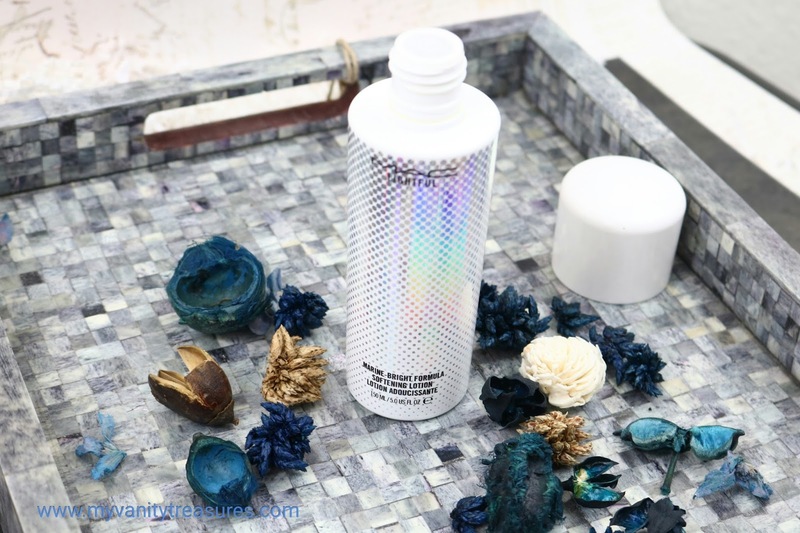 This Lightful C Marine Bright Formula is quite raved about in the blogging world and even got 5 star rating from on Beautypedia aka Paula's Choice. Lets take a closer look now! 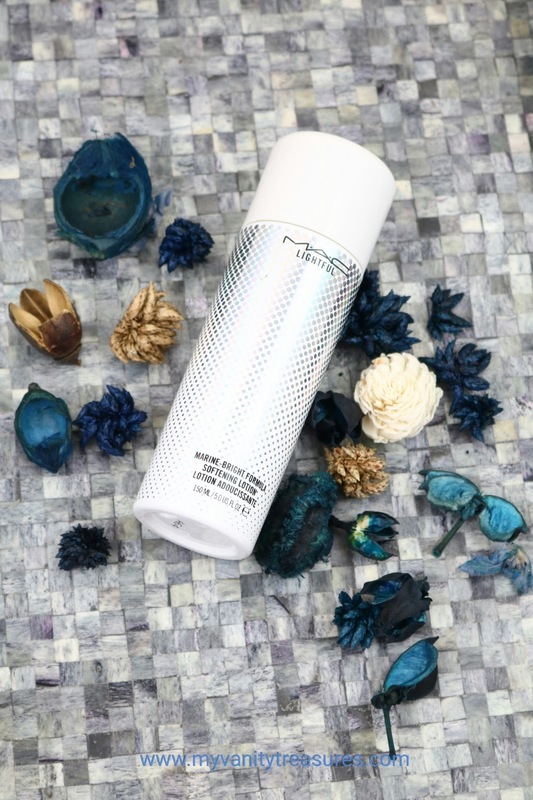 MAC Lightful C Marine Bright Formula Softening Lotion - A softening lotion infused with the active, high-power impact of our Marine-Bright Formula and Super-Duo Charged Water. Conditions and boosts depleted skin with moisture for a smoother, more supple look. Leaves skin refreshed, exceptionally soft, more clarified and brightened. Impact increases over time. I was introduced to Marine Bright formula line of skincare at the end of 2014 and since then I have repurchased this lotion twice! At the time I was living in an extremely dry climate and needed a moisturizing lotion for day time and this suited the bill perfectly! 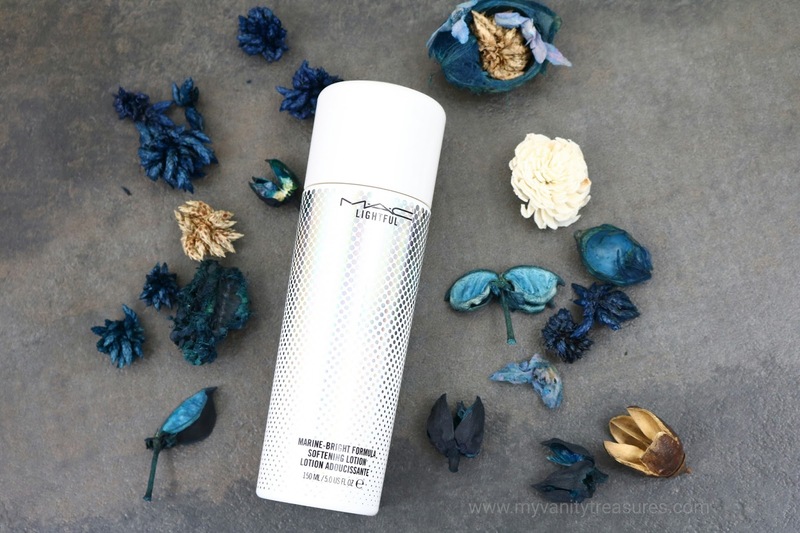 MAC Lightful C Marine Bright Formula Softening Lotion comes in a stunning white and silver packaging. The bottle is quite heavy and I wouldn't necessarily say its travel friendly due the bulky screw cap! The cap is so much more heavier than the bottle itself and is just strange to me, although I do like that the opening on top is tiny as this is quite a potent serum/essence and you would not want a ton of product on your face..but more on that later! The softening lotion is very moisturizing so it can be used as a hydrating toner as well as a moisturizer. The consistency is very watery and to be honest I was surprised how moisturizing it felt on the skin because the lotion itself feels very light weight. I apply it after my acid toner using a cotton round and often like to mix in few drops of Paula's Choice 2% BHA liquid with it. Due to very high content of glycerin which is the second ingredient in the lotion it does feel a little tacky afterwards and does not give a matte finish. I don't mind it much as I go over it with my moisturizer and this beneath actually helps with better absorption of my moisturizer. The lotion is jam packed with hydrating ingredients like glycerin, hyaluronic acid and lots of antioxidants, anti-bacterial and anti-inflammatory plant extracts! It does contain added benefits of Vitamin C which helps in reducing the dark spots and hyper pigmentation. It definitely is very hydrating and softening on the skin. With time I definitely saw an improvement in my overall skin tone as it imparts a healthy glow and also helps in overall brightening of the skin. It helps to reduce the redness and inflammation on the skin if any. This does not necessarily replace your Vit C Serums or other hyper pigmentation products but I think its a good moisturizing essence/lotion for day time use especially in summers as it is quite moisturizing. It also works perfectly under the makeup so that is an added bonus! I do think it will suit all skin types, extremely oily skin may not enjoy it much due to the tackiness it leaves behind but if you layer a more matte finish moisturizer or spf it should work fine. Dry skinned beauties will definitely need a moisturizer on top of this, but if you live in a hot humid weather depending upon your skin type you can definitely get away with it as a stand alone moisturizer. Also just to keep in mind, this does have a tiny bit of fragrance in the ingredients but its way far below on the ingredients list and it did not irritate my skin but this may be a problem for people with sensitive skin. Overall I think its a really good skincare product, which I did not really expect from MAC being primarily a makeup brand, although a tad bit expensive but as I mentioned above you really don't need a lot of it, a little goes a long way! Availability:- MACCosmetics, Nordstrom, Macys, Belk etc - I always prefer to buy from Nordstrom as they have excellent customer service plus free shipping with 3 samples! As always I'd suggest to get a sample first and try it before investing in a full size. I hope the review was helpful, pls do leave your suggestions and queries below and I will get back to them as soon as possible. Thank you for reading, until next time take care and stay beautiful!